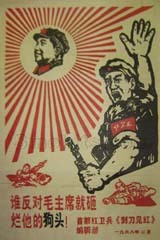 Propaganda posters of PRC, Cultural Revolution, Mao, and other posters. In an age when rebelliance was encouraged by the government, the posters, one of the mass publicity methods, were very different from what you usually see. Being a cult for a long time after the establishment of the People's Republic of China in 1949, Chairman Mao was featured in a lot of posters, which were necessities in almost every household dozens of years ago. Here are some posters of other renowned political figures or Chairman Mao with these political figures in the development course of Chinese history between 1950 and 1980, as well as some posters during this period that are not related to the Cultural Revolution. We will crash the "dog heads" of those who oppose Chairman Mao! The eight "Revolution model operas", namely, Taking Tiger Mountain by Strategy, On the Dock, Story of the Red Lamp, The Village of Shajiabang, Raid on the White Tiger Regiment, Red Detachment of Women, White-haired Girl, and Ode to the Dragon Riger, were the main art works advocated during the Cultural Reovlution. Long life the invincible Marxism, Leninism, and Mao Zedong thoughts!